oz.Typewriter: The Halda portable typewriter: Linking Swedish Antiquity with the Space Age. 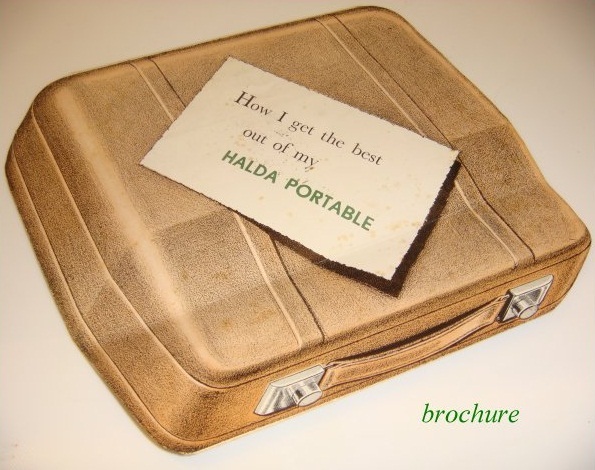 The Halda portable typewriter: Linking Swedish Antiquity with the Space Age. Having looked at the Facit TP1 last week, it’s appropriate we should also pay tribute to its immediate predecessor, the Halda portable typewriter. 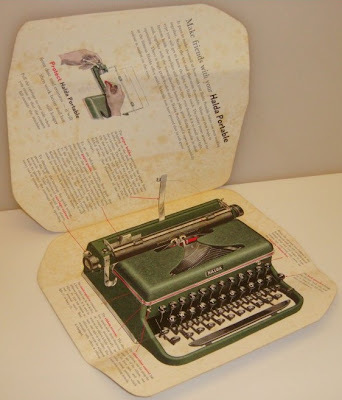 As many may be aware, at one time in the later stages of his writing career, Ernest Hemingway apparently broke away from American-made typewriters (Royals in particular) to use the Swedish Halda. There was, and perhaps still is, a Hemingway Halda on display in Havana (my understanding was that it was in a hotel foyer there; not a bedroom, which is a different hotel “exhibit” featuring a Henry Dreyfuss-designed Royal Quiet De Luxe and/or a Corona 3). 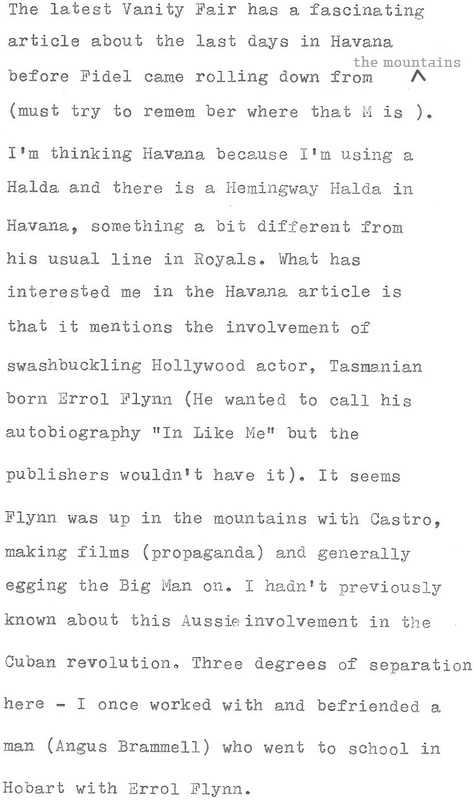 Maybe Hemingway owned more than one Halda (he did, after all, own at least five Royals, and the Halda is quite similar to the Royal Quite De Luxe). 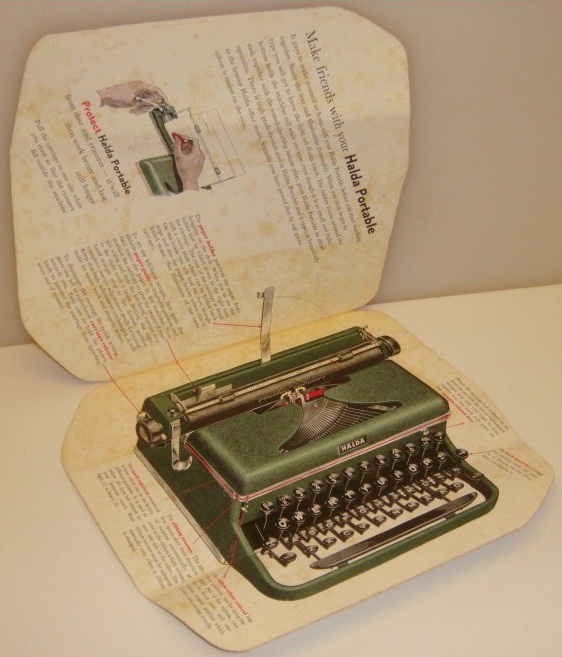 Attempts have been made to sell a Hemingway Halda for at least 10 years now, dating back to an eBay auction on this day, November 4, in 2001. The asking price remains $100,000. 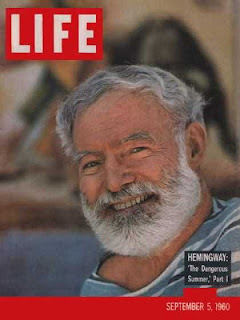 Hotchner (above, right) and Davis were certainly close to Hemingway at the time The Dangerous Summer was written, in 1959. 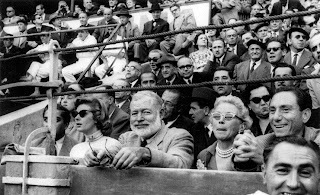 It should be borne in mind, however, that The Dangerous Summer was written in the main in Spain, where Hemingway was on assignment to Time-Life. The original concept was for Hemingway to write a 2000-word bullfighting piece for Sports Illustrated, at something like $150 a word (a world record rate for the time), but it grew to more than six times that length. 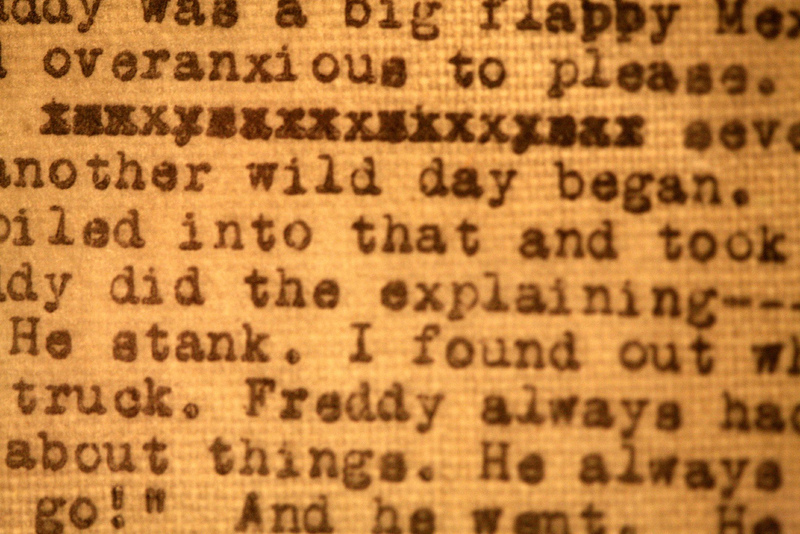 Life copy editors chopped it back to something closer to the desired length (30,000 words, published in three installments), and this and another 45,000 words of what was left subsequently found their way into one of those posthumous Hemingway books (1985)over which Hem had no control. 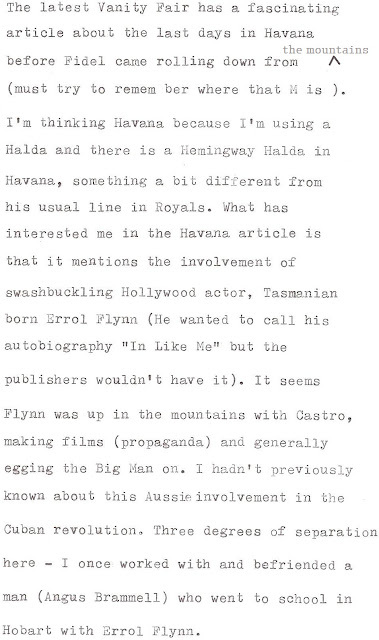 The Hemingway Halda University Archives has for sale comes in a case with American Export Line and French Line shipping stickers, which carry parts of the handwritten name “E. Hemingway”. In University Archives’ research into this machine, however, it appears the sellers may not realise the Halda was not made before 1948 (for one thing, it says, “It is certainly quite possible that the works that would later become A Movable Feast were also typed on this very machine). 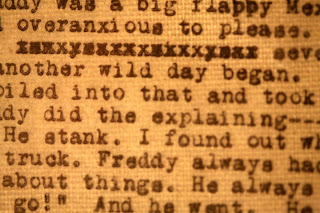 Calling the Halda “One of the most important literary relics of the 20th century, Ernest Hemingway's fully documented typewriter, on which he typed his last great work”, the seller compares the Halda with Babe Ruth's 60th home run bat, Sitting Bull's bow and arrow, Jack Kerouac's manuscript (above) for On the Road, Marilyn Monroe's Happy Birthday Mr President dress or the Maltese Falcon - "the stuff that dreams are made of". My Halda has the serial number P63929, which suggests it was made in 1955. It has a QZERTY keyboard, and while it was made in Sweden, it was marketed through the Italian-French company Lagomarsino. We know that in 1935 the British Oliver Typewriter Company made a standard typewriter which emerged from a merger of the Danish Norden company with Halda. 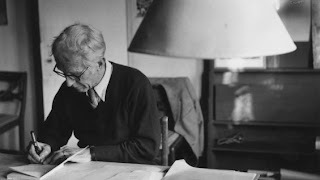 The Halda-Norden was designed by the legendary Danish architect and typographer Knud Valdemar Engelhardt. But to the best of my knowledge, this is the first sign Haldas were also build for distribution by an Italian and/or French company. This looked at a "French" portable, an LP44 distributed by Lagomarsino-France S.A., of the Rue Chaptal, Levellois-Perret, Paris. The LP44 is, however, Italian-made and is a relabelled Antares Compact. Lagomarsino was headquartered in Antares’ hometown of Milan. For all that, the Halda is Swedish to its very boots (or lack of them; the natty undertray, seen above, was replicated on the later Facits). It was designed by Carl Malmsten (above), the great Swedish interior and furniture designer, architect and, at the king's behest and by his decree, a professor. 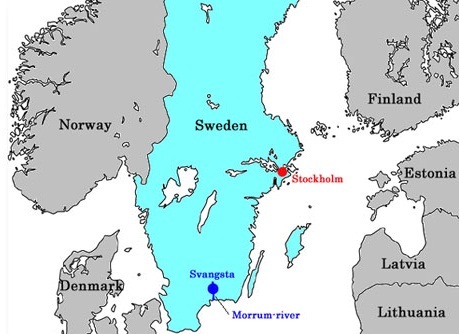 Though always known as “Carl”, Malmsten was born Charley Per Henrik Malmsten, in Klarakvarteren, a part of lower Norrmalm in the central part of Stockholm, on December 7, 1888. He was the child of a well-placed family. 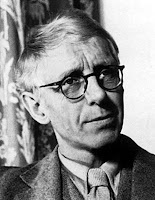 His father, Karl Adam Stahmer-Malmsten, was a prominent GP and a medical writer, and his grandfather, Per Henrik Malmsten, was a professor of medicine, a chief surgeon and a royal physician. Malmsten's mother, “Inez” Isabella Erika Viktorina Cadier, was the daughter of the founder of the Grand Hôtel in Stockholm, Regis Cadier. Carl Malmsten took his first steps in the art world while recovering in Egypt from health problems suffered during military training. 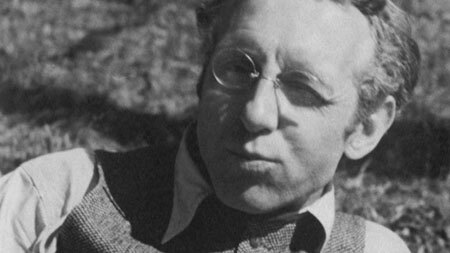 Rebelling against his privileged upbringing, Malmsten returned to Stockholm in 1909 to start an apprenticeship as a humble carpenter. For five years from 1911 he studied in an architect's office. In 1916, with two chairs, the first furniture he designed, Malmsten won both first and second prizes in a contest to design the interiors of the Stockholm City Hall. On the strength of this, Malmsten opened his own furniture store. Malmsten became a leading figure in Swedish “klassicism”, also called “Swedish Grace”. Influenced by Gustavian-period country manorial and rustic “rococo” furniture, and by folk art, while inspired by the artist Carl Larsson, Malmsten called for a revival of Swedish craftsmanship to produce work of simplicity and high technical quality. 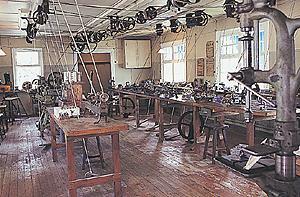 He urged a return to arts and crafts based on nature and tradition and reflecting a national identity. Malmsten rejected the Bauhaus school and railed against “functionalism”, complaining that the 1930 Stockholm Exhibition reflected “dull, imported anti-traditional style, mechanically dry and based on false objectivity". That same year Malmsten decorated the Waldorf Astoria in New York, and in 1939 he was involved in the World's Fair in New York. Malmsten produced beautiful yet highly functional and eternal pieces which created a unified and harmonious feeling, a pleasant sense of warmth. 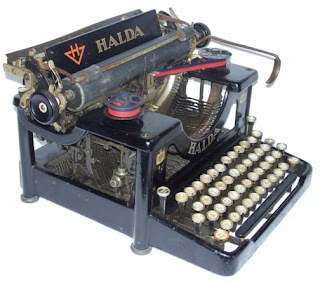 The Halda portable typewriter must be considered a classic example. It came at the height of Malmsten’s “golden age”. Here, as much as anywhere else in his work, is the true reflection of a designer who “fought for the right of humans to experience beauty”. 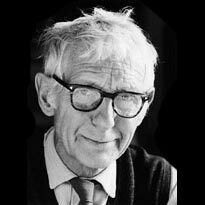 Malmsten died in Malmstens Hus, Solna, Stockholm on August 13, 1972, aged 83, and was buried the Vickleby cemetery on Southern Öland. The Halda company takes its name from its founder. 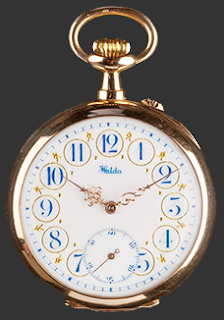 It was established in Svängsta by Mörrumsån in Blekinge in the south of Sweden in 1887 by watchmaker Henning Hammarlund, an 1880 graduate from the Geneva Academy of Horology. Hammarlund (below) was born in Varalöv on December 30, 1857. Like Camillo and Adriano Olivetti, Hammarlund took a paternal interest in the welfare of his workers, through their housing and social life outside the workplace. But Hammarlund was struck down by bad health in 1918 and by 1920 his company was in liquidation. Hammarlund died in Bastad on April 25, 1922. Halda had started making typewriters (similar to the Bar-Lock) in 1896 and in 1914 introduced an Underwood-type Model 8. 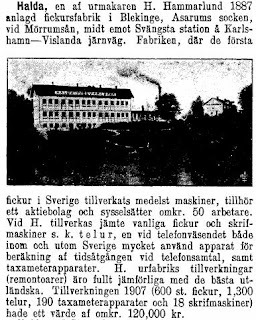 After Hammarlund’s company went into liquidation, AB Halda Fabriker was formed to maintain typewriter production, but this company went bankrupt in 1927. 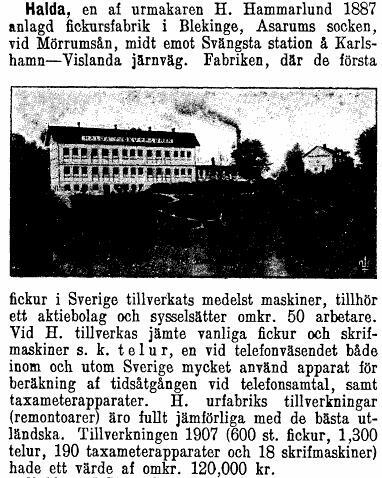 Halda AB was established, merged with Norden of Denmark in 1935, and three years later was taken over by AB Åtvidabergs Förenede Industrier and converted to a subsidiary under the name Facit-Halda AB. 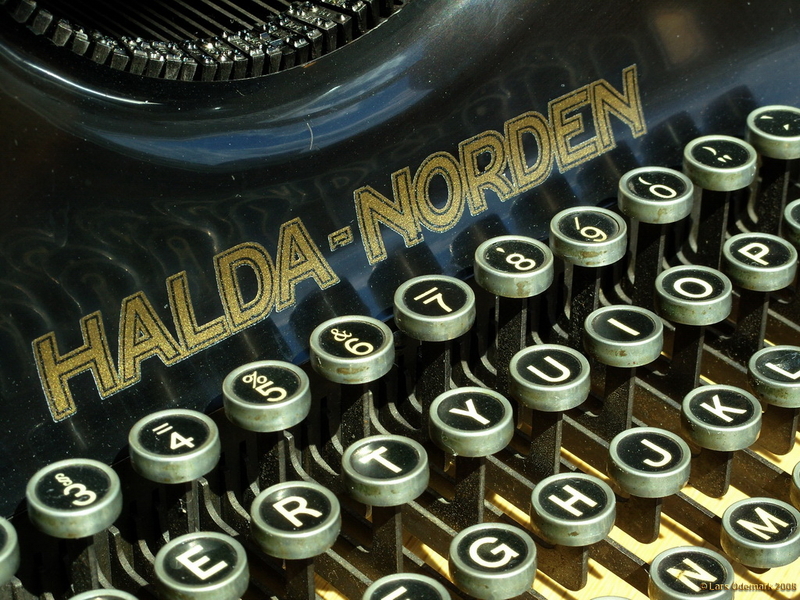 Halda remained the typewriter brand in the Åtvidaberg Group until 1957, when it switched to Facit. In 2009, the Halda name was resurrected and given a space age look by watch entrepreneur and engineer Mikael Sandström, who developed a new watch with a time-platform and two interchangeable time-modules. It is based on the same drive that Hammarlund used and was tested by Swedish astronaut Christer Fuglesang on one of his space missions. 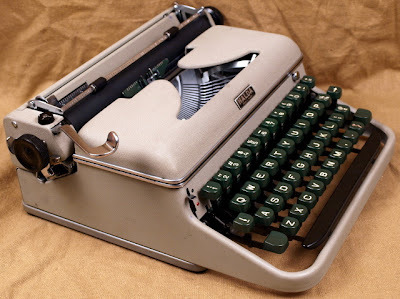 Ten years to sell - or try to sell - a typewriter? I think at this point even the value of $100,000 has changed - perhaps they might want to adjust higher for inflation? The PR on this must not be too impressive; this is the first time I'm hearing of it. Although at this rate, if it is still for sale at the same price in... say 70 years... I might be able to afford it then. Anyway. You have a beautiful Halda; and I am even more impressed that you manage to live - and type comprehensibly - with the QZERTY keyboard. 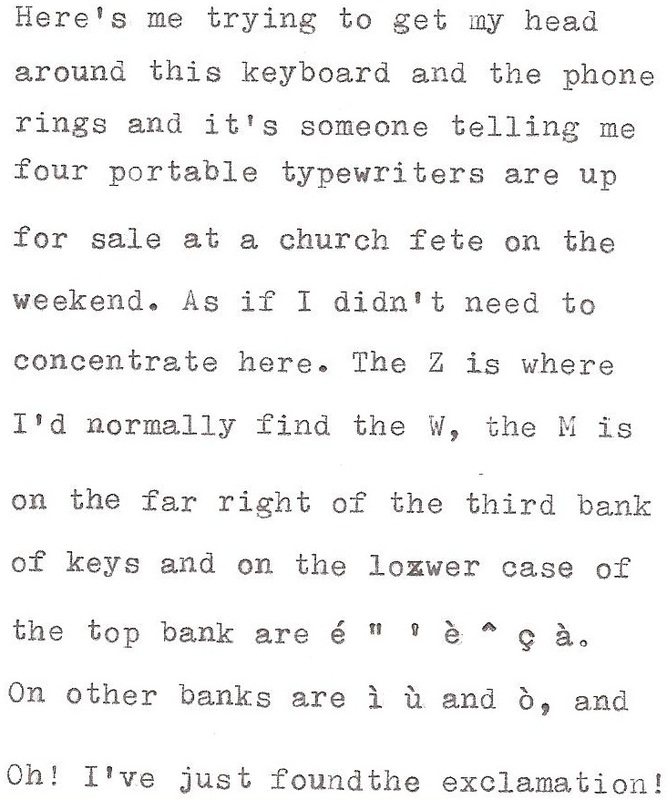 As a sometime-visitor to Italy, I use the keyboard arrangement as an excuse not to take advantage of the typewriter bounty on the local classifieds... otherwise I'd be in trouble! Another very illuminating piece of research. Thanks for shedding light on my handsome little Halda! I now have its big brother, too -- an office Halda with similar styling. The ad copy for that Hemingway Halda is really over the top. This is a fascinating companion-piece to your earlier post about the Facit. There are definite parallels between the Halda and the elegant, simple lines of Carl Malmsten's furniture. 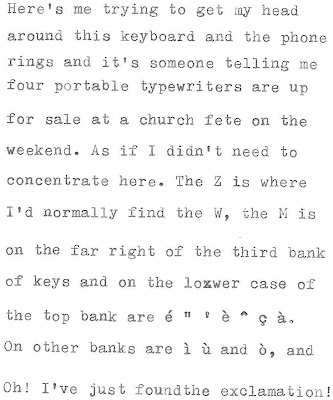 Is $100,000 the most ever asked for a typewriter? I have a lovely Halda typewriter in a very clever portable case (possilbly cardboard covered in vinyl with a sprung leather strap. I was wondering what year it was made, I cant find a serial no. and it has a $ key placed far right top. The case is tattered but the typewriter is perfect condition. I would love to look at the ribbon and see what stories it could tell. The serial number is directly behind the ribbon cover on the top right. You will need to move the carriage to the left to read it properly. The last of these was made in 1958, to the best of my knowledge. This could come in handy. I just snagged a very clean looking Halda the same colour as yours for, sitting down? £2.20. It was poorly listed as a Halba and is in the wilds of Dartmoor but hopefully will be here after Easter. my congratulation for your beautiful blog! 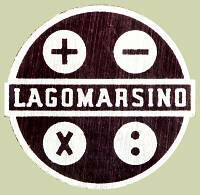 I have a portable Halda Lagomarsino. Do you know where can i find ribbon ink? In italy i can only find the ones for olivetti, but they are different. Hi. Yes, they are different. You may need to buy an Olivetti or Universal ribbon and wind it on to the existing Halda spools. Worth a try. Thank you,, I got only one original spool... So i have to wind it everytime back with my hands... Do you know if I can find the original Halda spool online? Yes, Gabriele, from memory the spools are hard to find. If I recall they have some sort of locking device underneath, like the old Royal standard. I'm afraid I don't know how you would be able to buy one. thank you very much for your anwers. Do you know how can i open the Halda to clean it inside? I usually do it on olivetti lettera 22, but I never understood how to open the Halda. I haven't got a Halda in front of me at the moment, but I imagine it's the same as most machines, including the Olivetti - start with the two screws underneath the carriage or at the back of the machine (where there will be four), turn the machine over and remove the screws holding the mask to the mechanics along the sides and possibly front and back. I notice from the images there are two screws where the ribbon spools cover clicks down, but I imagine they are for the frontispiece only. Hi! I recently bought a Halda without any spool. Is it possible to have a picture of the spool and a brief explanation on how the under lever that regulates the direction of the ribbon works? Hi Robert, a dive into exciting history! I cannot understand how it goes back from the serial number to the year of manufacture. 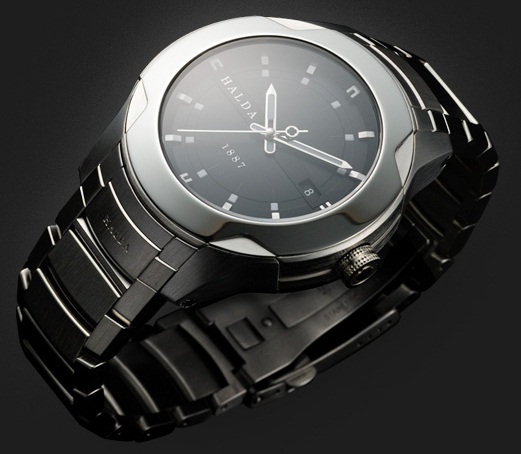 I have a HALDA series p. 133233. At what age would it date?